I duck-dived beneath the surface and the shark shot away into the blue… and that just about signalled the end of a fantastic day watching blue sharks out of Penzance with Charles Hood. 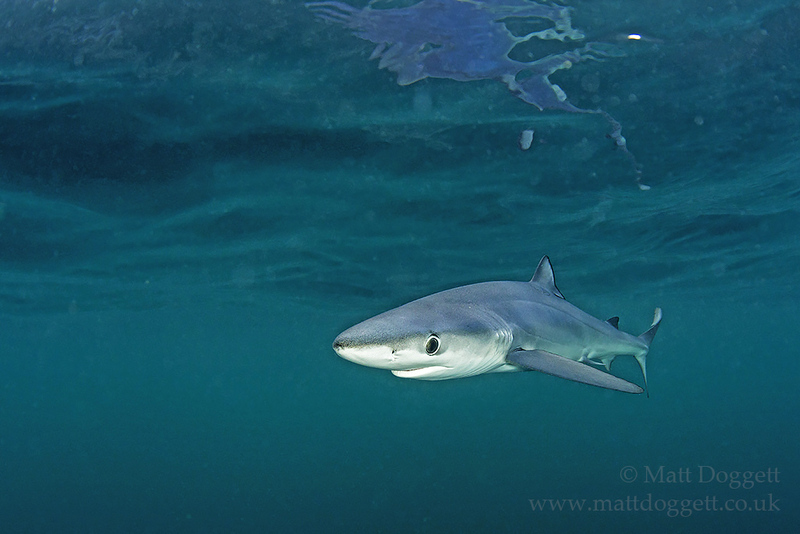 The waters offshore of Cornwall support a number of blue sharks, Prionace glauca that appears to be finally on the increase, albeit slight, following massive over-fishing in recent decades. Worldwide, tens of millions of blue sharks are killed each year, so it is hardly surprising that they have become a rare sight. 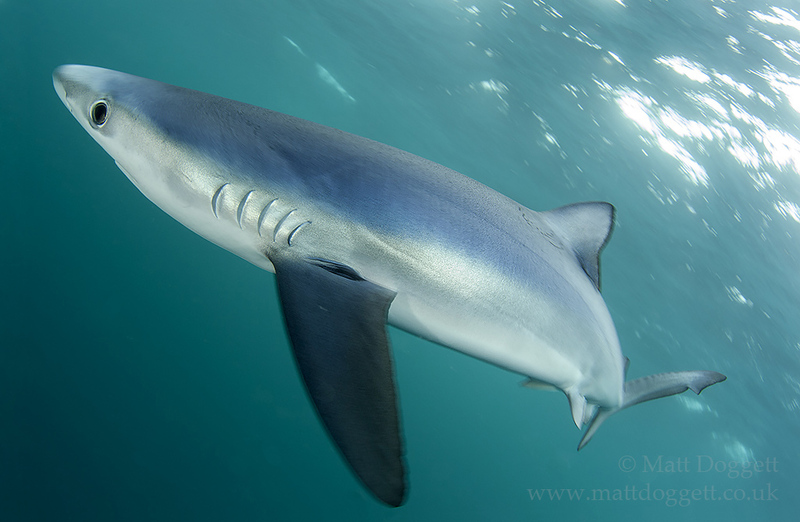 I had travelled to Penzance come and see blue sharks after hearing that Charles Hood was running trips to find and photograph them. The day involved a long run at least five or six miles offshore to a spot where Charles knows there is a high chance of attracting them. With a special mix of chum in the water we waited in anticipation that the sharks would follow the scent trail to the boat. Sharks have a highly receptive sense of smell and can detect prey from many miles away. Without this method of attracting the sharks, the chances of seeing them are practically zero. Some two hours after arriving on site the first shark arrived. And how blue it was! Until you have seen one it is almost impossible to appreciate their vivid colour and sleek body form. 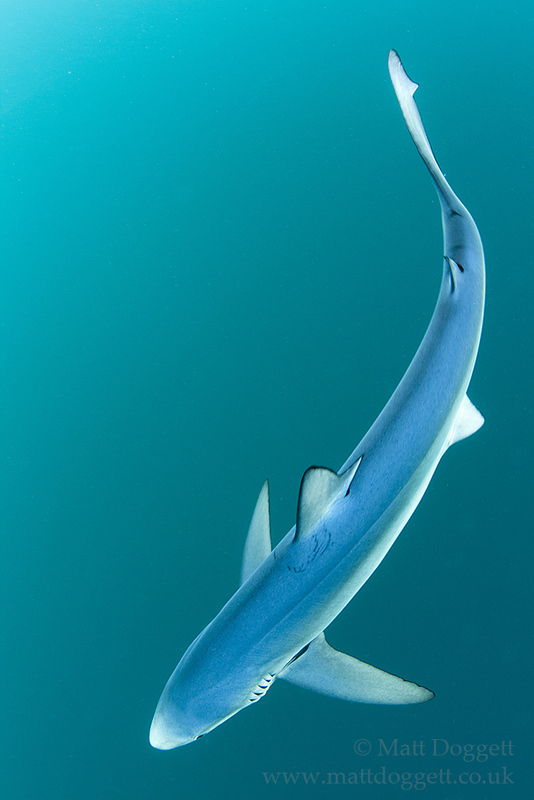 In nature, blue sharks feed on bony fish like mackerel and cod, and cephalopods such as octopus and squid. Stimulated by the potential of free food, the sharks remained around the boat for some time. Our first photographic efforts were over the side without entering the water; the sharks could be easily drawn near with the help of a fish on a rope. This was all well and good but it didn’t really allow one to meet these pelagic predators face-to-face. 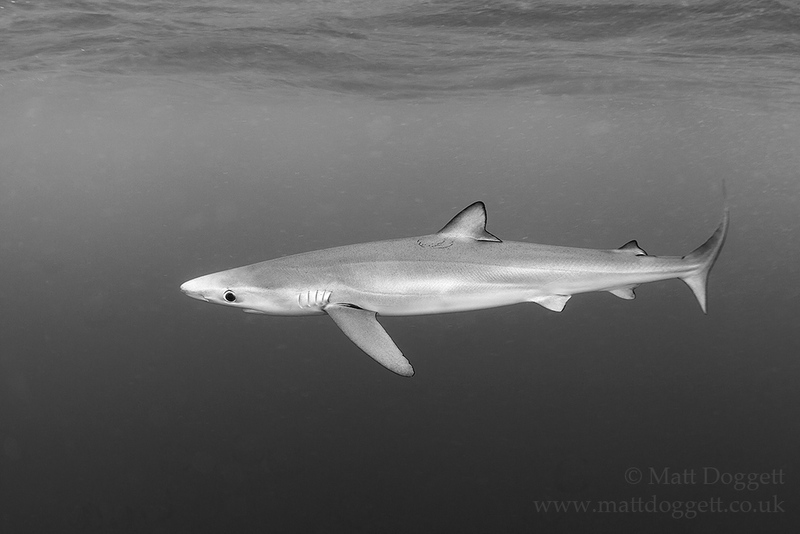 Despite feeding on small pelagic species, health and safety is a must when swimming with blue sharks. We wore all black with hood and gloves, lest the sharks mistake our white hands or ears for a fish. The sharks we saw on the day were all small ones, only about 4 feet long. Nonetheless there were no chances being taken. Slipping into the water the sharks showed no fear and would swim right up to me without hesitation but they were never intimidating. This gave us some different photographic angles, better compositions and a much more intimate experience. Only when I tried to duck dive below them did they perhaps feel threatened by me and exited the arena with lightning speed. In all I probably only had five or ten minutes face-to-face with the sharks though on other days they have remained around snorkelers for over an hour and perhaps I could have got in the water sooner. I guess the duration of a one-on-one encounter can depend on the individual shark’s tolerances as well as swimmers’ behaviours. Found in tropical and temperate seas, blue sharks undertake circular migrations of the North Atlantic on the oceanic currents; indeed, individuals tagged in the UK have been recorded on the eastern seaboard of the US just months later. Summer is all but over now but I’m already feeling the urge to return as soon as possible, maybe next year. Public perception of sharks still needs to change and sharks need a better press. To that end things have improved a little but I have still been amazed how many people just in the past few days have asked “weren’t you scared?” rather than “what was it like?”; or how many have remarked “I would never do that!” or “I didn’t know we had dangerous sharks in Britain.” These animals have been around our shores for millions of years and it should not be a surprise that they still are; they are less of a threat to people than a field full of cows. Sensationalist headlines like those this summer in the Mirror and Mail (I won’t even link to these dreadful articles) do little to help sharks’ cause, or to improve their PR. Suggestions that the presence of the blue or indeed great white sharks should be unnatural in UK waters are simply rubbish; calls for the capture of an ‘unknown monster shark’, or statements that people were surprised to see blue sharks (really? surprised? when you have gone out specifically to attract them with their natural prey?) only help stir the pot of media hysteria. Is the negative and over-hyped coverage for species threatened globally with extinction really worth it just to sell a paper? Big sharks with sharp teeth are here in the UK – that’s not new news… and they are more scared of us than we are of them. Only last week a world record thresher was caught off the Isle of Wight in the English Channel – and you’ll be pleased to note, released alive. We should be proud, we should embrace them and we should value them far more alive than dead. Mankind is their biggest threat. Let’s change that, find out what you can do at http://www.sharktrust.org/en/save_sharks.